Curly is definitely more into art than me. I remember quickly becoming bored with art as a preschooler. Not Curly! If she had a mantra, I think it might be something like “Art is Life!”. We haven’t been doing our themed preschool weeks lately, and I was trying to think of a reason why. Honestly, I think it’s because I got bored. We have still been doing art projects and reading books and doing science experiments, so it’s not that I’ve given up on preschool; I think I simply prefer to be more spontaneous. 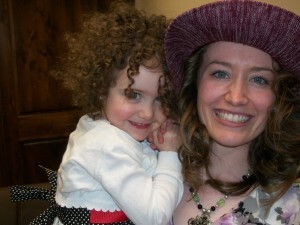 This being my first time teaching preschool, I am still finding my stride as to what works for me and our family. Perhaps in time I will figure out a way to keep my enthusiasm for themes going strong. In the meantime, we will continue to do what we find interesting at the time! This color mixing science experiment quickly turned into an art project of squirting the colored water onto paper towels. I am very proud of Curly’s progress in math. She can pick out straight lines, curved lines, and angles. She knows all her shapes and colors. She can finish simple patterns that I make with pattern blocks. She can recognize the numbers 1-10. A couple of these she couldn’t do just a few months ago, so the sudden jump in comprehension is very noticeable to me. 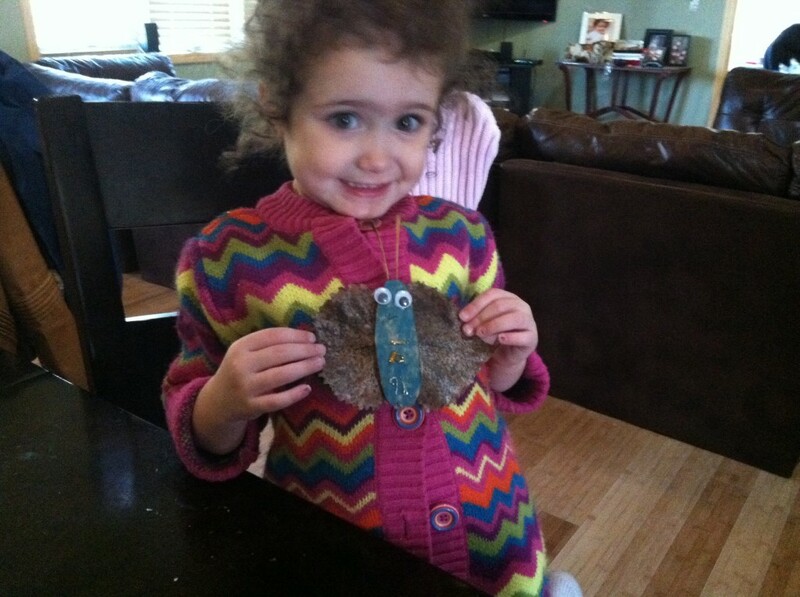 I could go on and on bragging about my kid, but I’m not sure most of you would find that very interesting. 😛 We have been up to a lot lately, besides preschool. We went on a family road trip to Utah and Nevada. 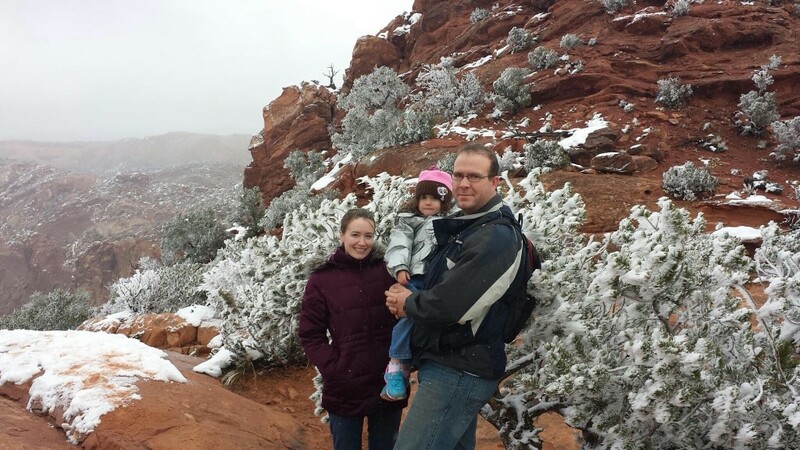 Here is a picture of us in Canyonlands National Park, Utah. It was extremely foggy while we were there. At first we were really disappointed we couldn’t see the full panorama of the canyons and cliffs, but everything being shrouded in mist was stunning in it’s own right. Plus, the fog created super cool frost on all the plant life! You can’t tell in this picture but it was lightly snowing, too. It was quite pretty against the red rock. I am going to try to be more regular about updating my blog now that we are back from the trip and there’s the long winter ahead of us. Curly keeps asking to go outside to play in the snow and I keep telling her the windchill is dangerously cold (at times -25 or colder). We take advantage of the warmer days and go out, but otherwise we are stuck at home a lot when it’s this cold. So, I should be able to keep with a blog, right? We will see how I do. I originally saw this over at No Time For Flashcards and thought it would be a fun and easy craft for us to do. Here are the instructions! 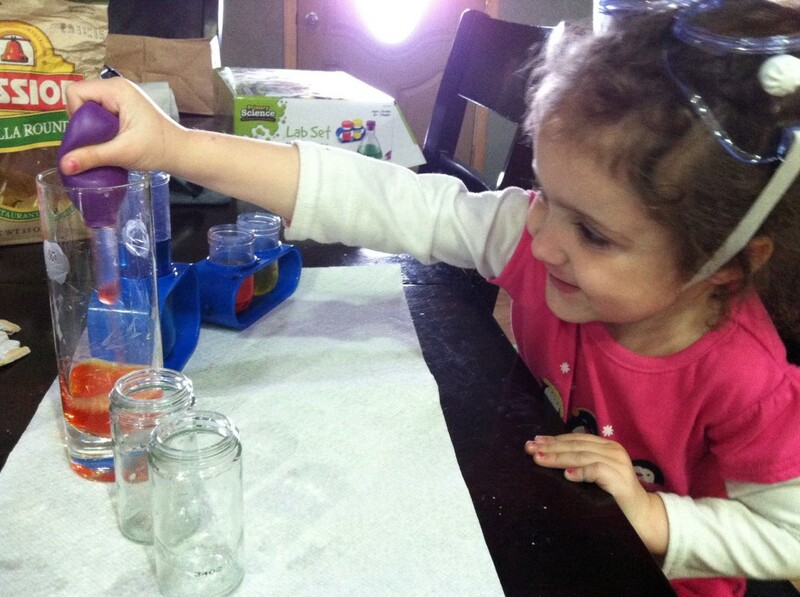 This craft is super simple and fun – it took us maybe 10 minutes. First, go out and find leaves that still have the stems attached. Pick leaves that would look like good butterfly wings! I had to search a little bit through all the narrow leaves to find some nice broad ones. Draw the body of the butterfly on a piece of cardboard. While your child decorates it, cut the stems off the leaves and save them, as they will become the antennae for your butterfly. Once your child is done, cut the body out of the cardboard and flip it over. Attach the ‘antennae’ to the back with glue or tape. Do the same with the ‘wings’. Flip back over and add googly eyes, a mouth, and other decorations if you wish. Curly added glitter glue to the body to add some necessary sparkle. And walla! A leaf butterfly. 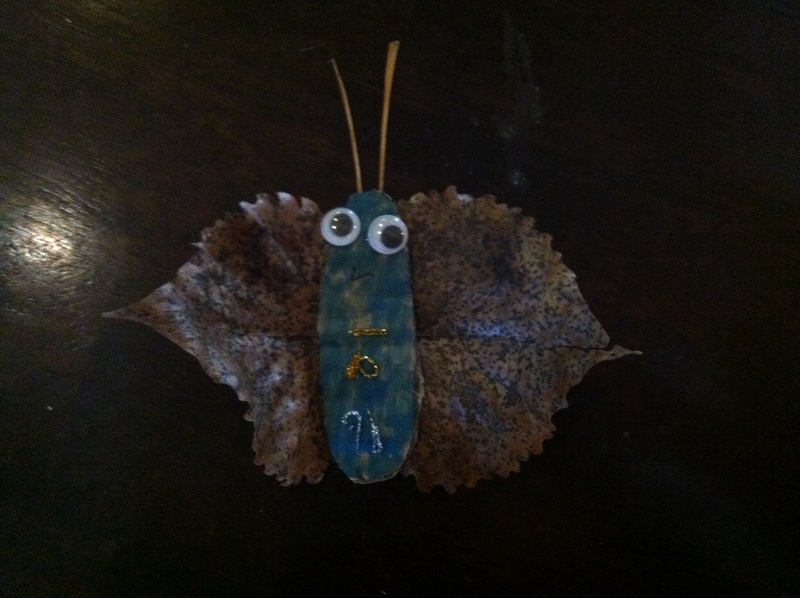 Do you have any fun and easy autumn crafts you would like to share? I have been absent for several weeks now from this blog. We have simply been very busy around here, and something had to give! We have been taking a break from themed art projects, but we have still been reading, reading, reading! The leaves have been dropping like crazy here up north, and I am loving it. Autumn is my favorite season. It’s a shame it doesn’t last longer. Here are some books I picked up at the library about leaves! Click on the covers to learn more about each book; the link will bring you to Amazon. Last week we started our Forest theme, which I have broken up into a few different sub-themes. 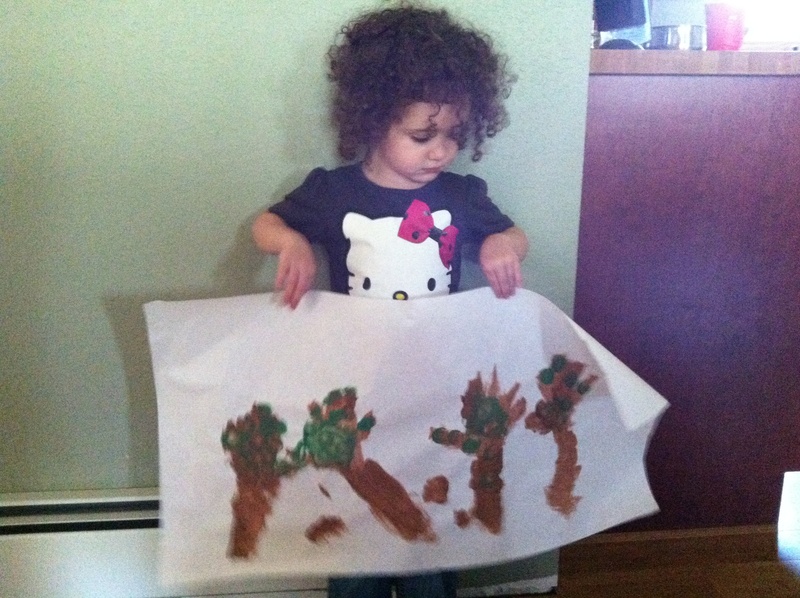 Last week we learned about trees! Here is our book list. There are many, many books about trees – I tried to stick to ones about temperate forests. You will notice the Lorax by Dr. Seuss is on the list – we also watched the video (the original cartoon, not the new animated one), which has turned into a favorite here. I found a printable from www.kidsunder7.com for Curly to practice tracing the letter T. She only made it for a couple letters before tiring of it, but I didn’t push it. 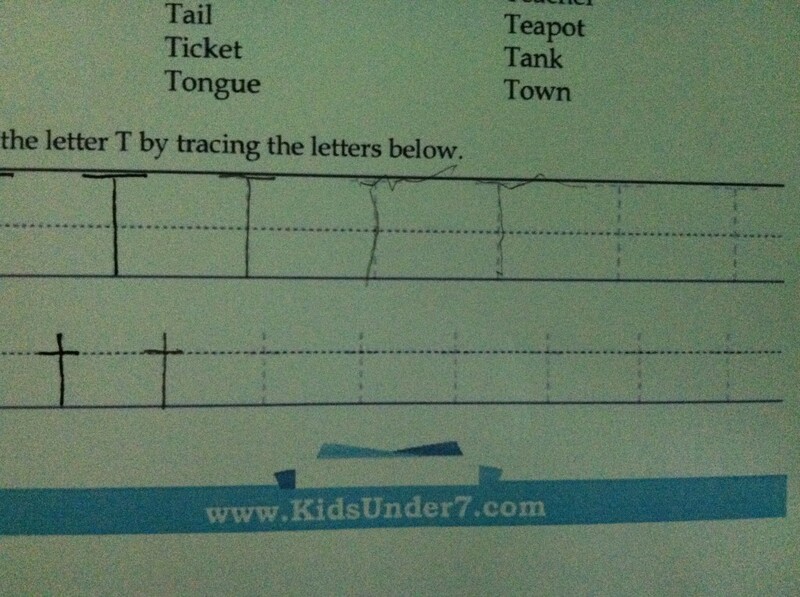 She has plenty of time to learn to write the letter T! Here is the worksheet. I appreciated the fact that this printable had a spot for both uppercase and lowercase, even though Curly didn’t use them. I will remember them for future use! Lately we’ve been focusing on the spelling of Curly’s name. I write her name for her on her projects and always have her spell it as I’m writing it. She gets confused by the end (her name is 6 letters long) but she’s getting better. She never let’s me forget that her name goes at the top of her workbook sheets, so we are getting lots of practice. For science we headed into our back yard to do some bark rubbings. We have mostly the same species of tree in our yard, the box elder, but we have many trees at different ages, so we were able to get a few different rubbings. 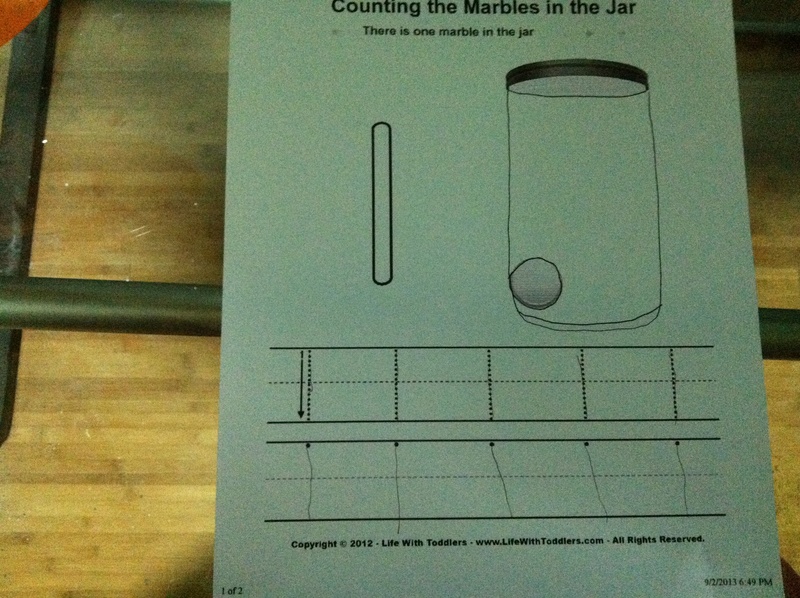 For math, I found a printable from www.lifewithtoddlers.com for Curly to practice tracing/writing the number 1. She enjoyed this one. We did a couple of different projects for art. 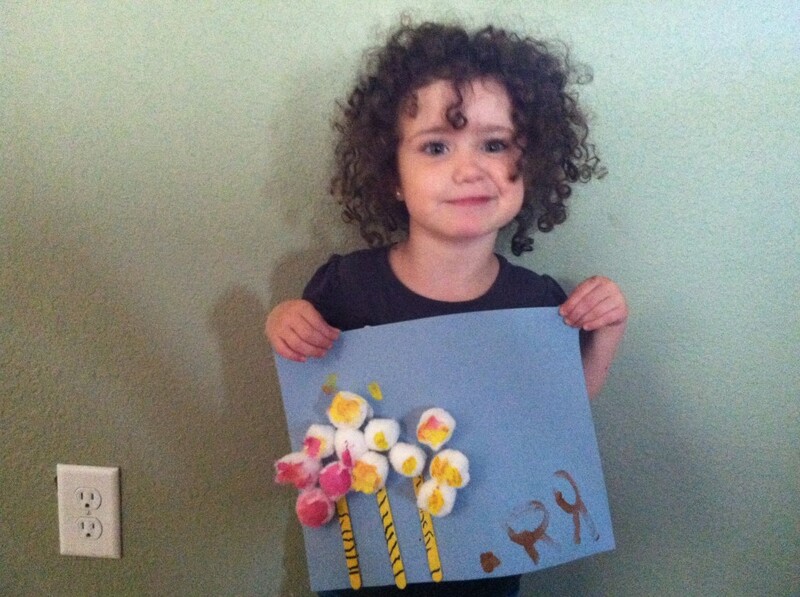 Since The Lorax was a such a favorite, we did a truffula tree craft with popsicle sticks, cotton balls, and paint. The brown figures on the bottom are barbaloots. We used black marker on the popsicle sticks to make them look like they do in the movie. We also did a forest project. 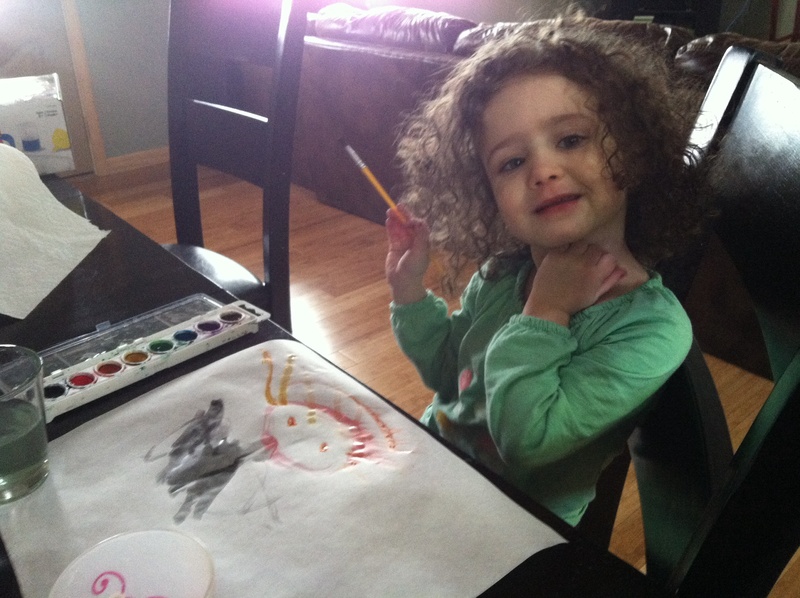 I traced Curly’s forearm and hand several times on a large piece of paper, then she painted them. Once they were dry, she used a round foam brush to stamp on some leaves. We hope you had a great week! I put this list together for part of our preschool Forest theme, so I left out books that dealt with rainforests. We will do a rainforest theme separately. I noticed while putting this list together that many ‘tree’ books are rather sad stories. I left those off the list. I think those books have their place, and that the subjects addressed in them (death, selfishness, etc) would be better suited for an actual discussion of those ideas. Here are the books we selected for our Tree week! Click on the book covers for more information. This post contains affiliate links. 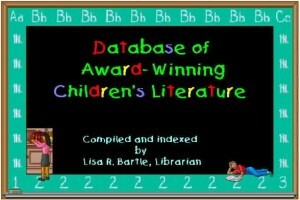 As you can see, there are oodles of tree books. Happy reading!